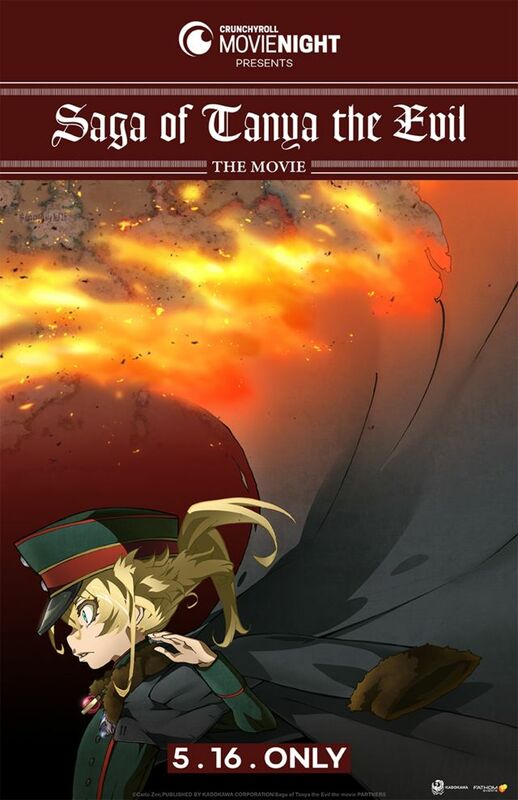 On Friday, Crunchyroll announced that it will screen the Saga of Tanya the Evil (Yōjo Senki) anime film at over 500 theaters across the United States as apart of their Crunchyroll Movie Night event. The movie would be screened in theaters for only one night on May 16. Crunchyroll has also revealed the promotional trailer and a visual for the movie screening. Crunchyroll has partnered with Fathom Events to the screen the English subtitled version of the popular Saga of Tanya the Evil: The Movie. The tickets are available for pre-purchase on Fathom Events website. Along with the movie, fans will get the chance to see an exclusive interview with the film’s director, Yutaka Uemura and get to know more about behind the scenes. Crunchyroll and Fathom Events have previously partnered together to bring the Mob Psycho 100 II theatrical premiere and the Yuri!!! on ICE marathon event to theaters across America. The movie first realsed in Japan on February 8 and earned 200 million yen (about US$1.8 million) as of February 23.